They may provide impressive views of sparkling oceans and lakes, but the following waterfronts prove that each contribute something special to their experiences. Some spin their guests around while they bob up and down; and some act as time machines sending them on a whirlwind trip to the past. Always full of excitement and aiming to please, these waterfronts are much more than landscapes perched along water — they are ultimate playgrounds. Waterfront Geelong has everything one would expect from a pier, including restaurants, manicured lawns and aquatic adventures along the Corio Bay. But it is the carousal that doubles as a thrill ride for kids and a time machine for its oldest riders. Set in a sleek pavilion that reflects the sunlight with touches of glass and steel embedded into its design, once the steam of the carousel powers up, visitors are taken for an amazing ride. The South Street Seaport is always buzzing with activity. After all, it is located in the city that never sleeps, which means tons of excitement for visitors. 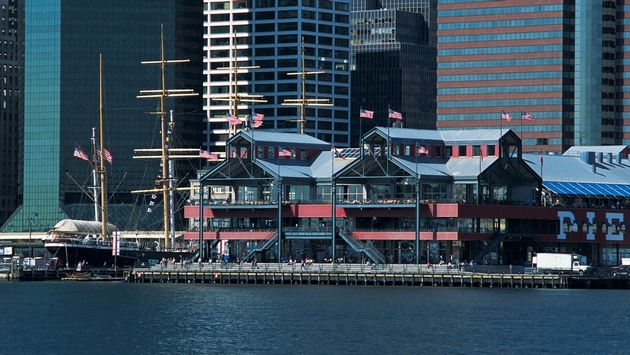 The waterfront is also full of history which is thoroughly documented in the South Street Seaport Museum. It invites visitors to climb on board and sail into the seafaring past of New York through its collection of legendary ships and artifacts. The migrations of sea lions are one of the most fascinating animal shows on the planet. Yet, following their movement is difficult because they spend a lot of time underwater as well. But that’s where the Pier 39 comes in handy, because it offers a front row view of these world travelers live in action. During the winter, the waterfront is populated with hundreds of sea lions taking a break from their long journey before heading back to the Channel Islands to breed in summer. A Visit to the Marsamxett Harbour offers up impressive views of the ocean. But what really sets this port apart is the historic Fort Manoel that calls it home. Accessible by boat, the building radiates in an 18th century décor even after surviving many years as a shelter for the military. Now, it is pivotal point when exploring Malta’s past and a prized possession of the harbor.